So here we are at the 5th part of a never ending tale (tail) of comedy. That was a well crafted sentence right there. Anyways, year after I die people will look at these gems and have no doubt why civilization died out. I’m really self deprecating today. Saying you are self deprecating is just an excuse to beat up on yourself. I really need to stop that. I hope you have been enjoying my attempts at making you laugh. At best I hope I make you think. If I have to tickle you into it then I will do that! Here it is….all about death and Barry Manilow. I have asked myself the reason for these little updates. I’m trying to find my own voice. If I can truly write what I’m really thinking and feeling then maybe one day I can help the characters in my stories do the same thing. I’m not sure this is the way to go about it. Oh yeah and I have delusions of being amusingly and hysterically funny. Clearly I miss the mark on so many levels. This is a weird awkward comedy update. I wrote the ending after seeing a Bob Saget show. I am usually not raw at all. But it seems appropriate given the show I had lived though. Maybe that also misses the mark. I cannot be sure. I always wonder if I’m smart enough or if my brain will ever work quickly enough to attempt stand up. These “thoughts’ arrive relatively quickly but I have the luxury of time to ruminate over them. It’s not my intention to insult or hurt anyone. This preamble is too long. NEW: I’ve decided to release this on Pi day or…..Steak day. You’ll see why this is….appropriate if you read beyond the cut. Saturday, November 10th was the premier of Chris Hardwick’s hour comedy special on Comedy Central. It seems like yesterday that the special was filmed—if yesterday was February 17th. I’m sure that Comedy Central has lots of things that they need to edit in order to air them. Like fine wines this was worth the wait. It was great to see the finished product. It was like a sweet walk down memory lane. It brought to mind that awesome February day when I took a train to New York. I met my friend Gillian. We walked to the theater and waited…..and waited…and waited. We wanted to get good seats. Since we were 4th in line we managed to get seats in the first row of non-VIPs. I decided to use the word press blog as a supplemental to the podcast. 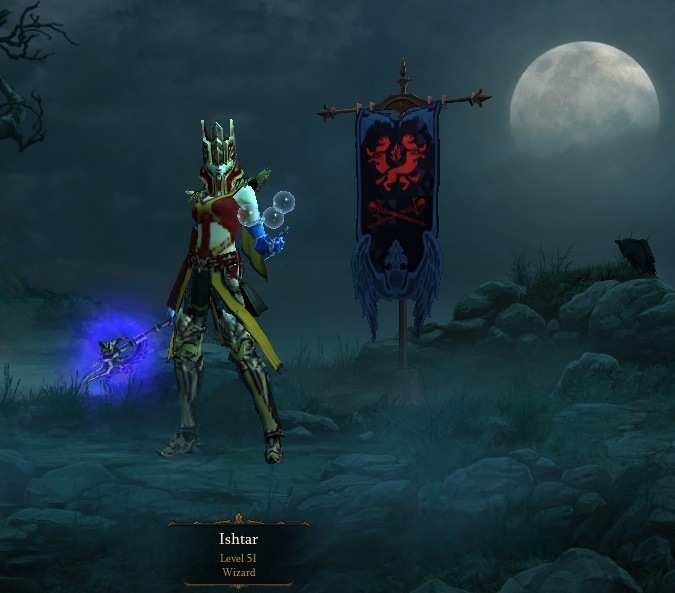 The above is a picture of my Diablo 3 mage Ishtar. I haven’t played much so there she is. FYI: The first character in any game is always Ishtar. My second is Lydia. The reason for Ishtar is that it was a movie that was super hyped and bombed horrible. The movie stars Dustin Hoffman and Warren Beatty. I don’t think the movie was bad. It suffered because the expectations were so high. I think one’s enjoyment of something is relative to how far away the experience is from your expectation of it. I always try to have an expectation level of 0. This is to give my experiences a fighting chance. I admit that this isn’t possible. The philosophical issue this week is body image. I focused on being larger than what we typically see. There are people who are naturally thin. They are tiny pixiesque people. They eat but due to genetics and habit they are just naturally very thin. Society loves to make you feel bad and guilty about yourself. Sure there are the “you are beautiful” campaigns. But who really subscribes to those? I think what we find beautiful is the familiar. If we are constantly seeing images of a certain body type then that body type becomes the norm. It becomes the standard. Different often gets noticed in a negative way. The bottom line is to focus in on being healthy. Make sure you exercise and try to eat healthy. The rest will take care of itself. The song of the week was Philosophy by Ben Fold’s Five. The version I use if off Ben Fold’s album “Best Imitation of Myself.” This is a compilation of the best of Ben Folds and Ben Folds Five. It is a good album to pick up if you are just starting to get into Ben Folds. With the new album about to be released, I’ve been catching up on the previous music of Ben Folds. This song is a great song to use as my intro my philosophy section of my podcast. The piano is the usual catchy music. The lyrics are outstanding. This is just a fun song. I hope you like it. Thank you for listening to my podcast! If you like Nerdist podcasts I highly recommend This week with Larry Miller. Larry is still recovering so take this time to catch up on the show! It is well worth the time. Oh and Chloe Dykstra has a new series out called “Cool Story Chlo.” I have the first two episodes at the bottom of this page. Support the show by liking the Facebook Page or reviewing on iTunes! Go to http://support.dihard.info for more ways to support my humble podcast!